What are the signs and symptoms of congestive heart failure? What tests diagnose congestive heart failure? What is the treatment for congestive heart failure? Can diet, exercise, weight control, and diuretics treat congestive heart failure? What is the long-term prognosis for congestive heart failure? What is the life expectancy? Can congestive heart failure be prevented? How does someone cope with congestive heart failure? Congestive heart failure (CHF) is a condition in which the heart's function as a pump is inadequate to meet the body's needs. Many disease processes can impair the pumping efficiency of the heart to cause congestive heart failure. 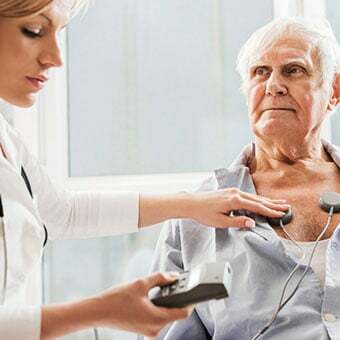 The diagnosis of congestive heart failure is based on knowledge of the individual's medical history, a careful physical examination, and selected laboratory tests. The treatment of congestive heart failure can include lifestyle modifications, addressing potentially reversible factors, medications, heart transplant, and mechanical therapies. The course of congestive heart failure in any given patient is extremely variable. Heart failure describes the inability or failure of the heart to meet the needs of organs and tissues for oxygen and nutrients. This decrease in cardiac output, the amount of blood that the heart pumps, is not adequate to circulate the blood returning to the heart from the body and lungs, causing fluid (mainly water) to leak from capillary blood vessels. This leads to the symptoms that may include shortness of breath, weakness, and swelling. 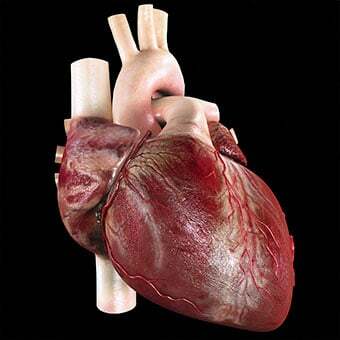 The right side of the heart pumps blood to the lungs while the left side pumps blood to the rest of the body. Blood from the body enters the right atrium though the vena cava. 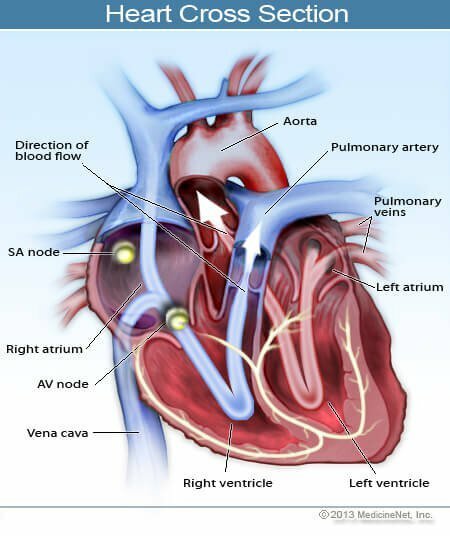 It then flows into the right ventricle where it is pumped to the lungs through the pulmonary artery, which carries deoxygenated blood to the lungs. In the lungs, oxygen is loaded onto red blood cells and returns to the left atrium of the heart via the pulmonary veins. Blood then flows into the left ventricle where it is pumped to the organs and tissues of the body. Oxygen is downloaded from red blood cells into the various organs while carbon dioxide, a waste product of metabolism, is added to be removed in the lungs. Blood then returns to the right atrium to start the cycle again. The pulmonary veins are unusual in that they carry oxygenated blood, while the pulmonary artery carries deoxygenated blood. This is a reversal of duties versus the roles of veins and arteries in the rest of the body. Picture of a cross section of the heart. Left heart failure occurs when the left ventricle cannot pump blood to the body and fluid backs up and leaks into the lungs causing shortness of breath. Right heart failure occurs when the right ventricle cannot adequately pump blood to the lungs. Blood and fluid may back up in the veins that deliver blood to the heart. This can cause fluid to leak into tissues and organs. It is important to know that both sides of the heart may fail to function adequately at the same time and this is called biventricular heart failure. This often occurs since the most common cause of right heart failure is left heart failure. The hallmark and most common symptom of left heart failure is shortness of breath and may occur. Due to fluid (water, mainly) accumulation in the lungs or the inability of the heart to be efficient enough to pump blood to the organs of the body when called upon in times of exertion or stress. 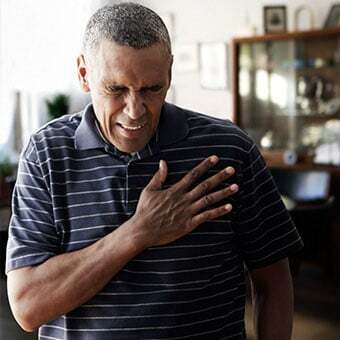 Chest pain or angina may be associated, especially if the underlying cause of the failure is coronary heart disease. People with right heart failure leak fluid into the tissue and organs that deliver blood to the right heart through the vena cava. Back pressure in capillary blood vessels cause them to leak water into the space between cells and commonly the fluid can be found in the lowest parts of the body. Gravity causes fluid to accumulate in the feet and ankles but as more fluid accumulates, it may creep up to involve all of the lower legs. Fluid can also accumulate within the liver causing it to swell (hepatomegaly) and within the abdominal cavity (ascites). Ascites and hepatomegaly may make the patient feel bloated, nauseated, and have abdominal pain with the feeling of distension. Depending upon their underlying illness and the clinical situation, patients may have symptoms of right heart failure, left heart failure, or both. In people with congestive heart failure with underlying heart disease, taking certain medications could lead to the development or worsening of the lung disease. Moreover, drugs that can cause sodium retention or affect the power of the heart muscle. 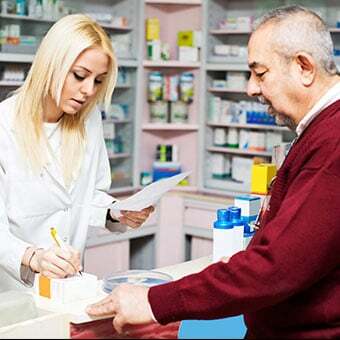 Examples of such medications are the commonly used nonsteroidal anti-inflammatory drugs (NSAIDs), which include ibuprofen (Motrin and others) and naproxen (Aleve and others) as well as certain steroids, some medication for type 2 diabetes, for example, rosiglitazone (Avandia) or pioglitazone (Actos), and some calcium channel blockers (CCBs). The New York Heart Association has developed a scale that commonly is used to determine the functional capabilities of heart failure. Class I: Patients without limitation of physical activity. Class II: Patients with slight limitation of physical capacity, in which marked increase in physical activity leads to fatigue, palpitations, dyspnea, or angina pain; they are comfortable at rest. 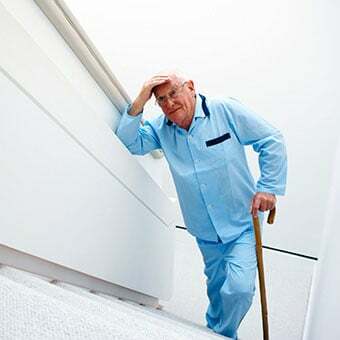 Class III: Patients with marked limitation of physical activity in which minimal ordinary activity results in fatigue, palpitation, dyspnea, or angina pain; they are comfortable at rest. 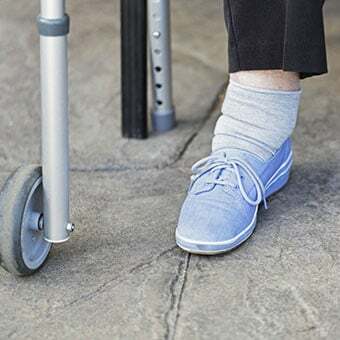 Class IV: Patients who are not only unable to carry on any physical activity without discomfort but who also have symptoms of heart failure or the angina syndrome even at rest; the patient's discomfort increases if any physical activity is undertaken. Congestive heart failure is often a consequence of atherosclerotic heart disease and therefore the risk factors are the same: poorly controlled high blood pressure, high cholesterol, diabetes, smoking, and family history. Heart valve disease becomes a risk factor as the patient ages. Other causes of heart failure have their own set of risk factors and predispositions and it becomes a complication of those diseases. Such causes may include obstructive sleep apnea, alcohol and drug abuse, infections, and connective tissue disorders like systemic lupus erythematosus, sarcoidosis, and amyloidosis. Many patients have stable congestive heart failure but can decompensate when a change occurs to their body. For example, a patient with congestive heart failure may be doing well but then develops pneumonia, an infection of the lungs, or suffers a heart attack. The patient's heart may not be able to react to the body's changing environment and does not have the capability or reserve to meet the body's energy needs. As well, acute decompensation may occur if the patient drinks excess fluid, has a large intake of salt that can retain water in the body, or forgets to take their routine medication. Congestive heart failure can be a medical emergency, especially if it acutely decompensates and the patient can present extremely ill with the inability to breathe adequately. In this situation, the ABCs of resuscitation (Airway, Breathing, and Circulation) need to be addressed while at the same time, the diagnosis of congestive heart failure is made. Electrocardiogram (EKG, ECG) to help assess heart rate, rhythm, and indirectly, the size of the ventricles and blood flow to the heart muscle. Chest X-ray to look at heart size and the presence or absence of fluid in the lungs. Blood tests may include a complete blood count (CBC), electrolytes, glucose, BUN, and creatinine (to assess kidney function). B-type natriuretic peptide (BNP) may be helpful in deciding if a patient has shortness of breath from congestive heart failure or from a different cause. It is a chemical that is located in the heart ventricles and may be released when these muscles are overloaded. Echocardiography or ultrasound testing of the heart is often recommended to assess the anatomy and the function of the heart. In addition to being able to evaluate the heart valves and muscle, the test can look at blood flow within the heart, watch the chambers of the heart contract, and measure the ejection fraction (percentage of blood ejected with each beat - normal = 50% to 75%). Other tests may be considered to evaluate and monitor a patient with suspected congestive heart failure, depending upon the clinical situation. Treatment may try to decrease fluid within the body so that the heart does not have to work as hard to circulate blood through the blood vessels in the body. Fluid restriction and a decrease in salt intake may be very helpful. ACE inhibitors (angiotensin converting enzyme inhibitors) and ARBs (angiotension receptor blockers) are medicines that are also shown to increase survival by decreasing systemic resistance and favorable altering the hormonal milieu, which affects the cardiac performance; they are often used with other drugs. Beta blockers may control heart rate and increase cardiac output and ejection fraction, and provide a beneficial response to circulating epinephrine ("adrenalin"). Digoxin (Lanoxin) is an older medicine that may help increase cardiac output and control symptoms. A very mild newer diuretic, spironolactone, has been shown to be of long-term benefit. Cardiac risk factor modification is the cornerstone of prevention of congestive heart failure, Moreover, it may benefit patients with congestive heart failure. People with end stage congestive heart failure (NYHA stage IV) may require aggressive treatments including left ventricular assist devices (LVAD), an implanted pump that helps increase the heart's ability to squeeze, or even heart transplantation. People with congestive heart failure are not transplant candidates, LVAD may be a permanent treatment. After congestive heart failure is diagnosed, treatment should be started immediately. Lifestyle modification is one of the most important aspects a patient can incorporate to treat congestive heart failure. Some of these lifestyle changes include diet, exercise, fluid regulation, and weight maintenance. Sodium causes an increase in fluid accumulation in the body's tissues. Because the body is often congested with excess fluid, patients become very sensitive to the levels of intake of sodium and water. Restricting salt and fluid intake is often recommended because of the tendency of fluid to accumulate in the lungs and surrounding tissues. 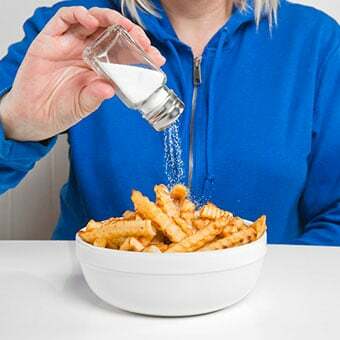 A "no added salt" diet can still contain 4 to 6 grams (4000 to 6000 milligrams) of sodium per day. In individuals with congestive heart failure, an intake of no more than 2 grams (2000 milligrams) of sodium per day is generally advised. Reading food labels and paying close attention to total sodium intake is very important. Severe restriction of alcohol consumption. 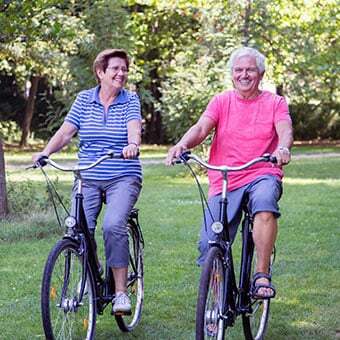 Aerobic exercise, once discouraged for congestive heart failure patients, has been shown to be beneficial in maintaining overall functional capacity, quality of life, and perhaps even improving survival. Each person's body has its own unique ability to compensate for the failing heart. Given the same degree of heart muscle weakness, individuals may display widely varying degrees of limitation of function. Regular exercise, when tailored to the person's tolerance level, appears to provide significant benefits and should be used only when the individual is compensated and stable. The total amount of fluid a patient consumes must be regulated. Although many people with congestive heart failure take prescription diuretics to aid in the elimination of excess fluid, the action of these medications can be overwhelmed by an excess intake of water and other fluids. The maxim that "drinking eight glasses of water a day is healthy" certainly does not apply to patients with congestive heart failure. Patients with more advanced cases of congestive heart failure are often advised to limit their total daily fluid intake from all sources to 2 quarts. The above guidelines for sodium and fluid intake may vary depending on the severity of congestive heart failure in any given individual and should be discussed with their physician. An important tool for monitoring an appropriate fluid balance is the frequent tracking of the patient's body weight. An early sign of fluid accumulation is an increase in body weight. This may occur even before shortness of breath or swelling in the legs and other body tissues (edema) is detected. A weight gain of 2 to 3 pounds over 2 to 3 days should prompt a call to the physician, who may order an increase in the dose of diuretics or other methods designed to stop the early stages of fluid accumulation before it becomes more severe. With the availability of newer drugs to potentially favorably affect the progression of disease, the prognosis in congestive heart failure is generally more favorable than that observed just 10 years ago. In some cases, especially when the heart muscle dysfunction has recently developed, a significant spontaneous improvement is not uncommonly observed, even to the point where heart function becomes normal. Heart failure is often graded on a scale of I to IV based on the patient's ability to function. Class I includes patients with a weakened heart but without limitation or symptoms. Class II describes patients whose only limitation is heavier workloads. Class III includes patients who experience limitation with everyday activity. Class IV describes patients with severe symptoms at rest or with any degree of effort. 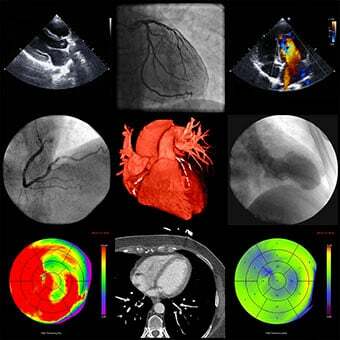 The prognosis of heart failure patients is very closely associated with the functional class. An important issue in congestive heart failure is the risk of heart rhythm disturbances (arrhythmias). Of those deaths that occur in individuals with congestive heart failure, approximately 50% are related to progressive heart failure. Importantly, the other half are thought to be related to serious arrhythmias. A major advance has been the finding that nonsurgical placement of automatic implantable cardioverter/defibrillators (AICD) in individuals with severe congestive heart failure (defined by an ejection fraction below 30% to 35%) can significantly improve survival, and has become the standard of care in most such individuals. In some people with severe heart failure and certain ECG abnormalities, the left and right side of the heart don't beat in rhythm, and inserting a device called a biventricular pacer can significantly reduce symptoms. Congestive heart failure is the result of an underlying illness, whitch is often atherosclerotic heart disease. Controlling those risk factors may help with congestive heart failure prevention. 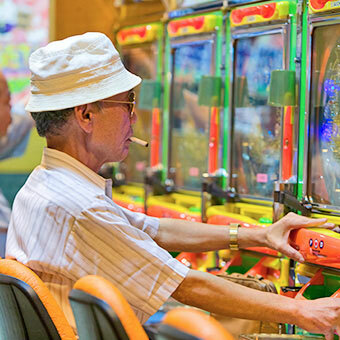 These include lifelong control of high blood pressure, high cholesterol, and diabetes and smoking cessation. 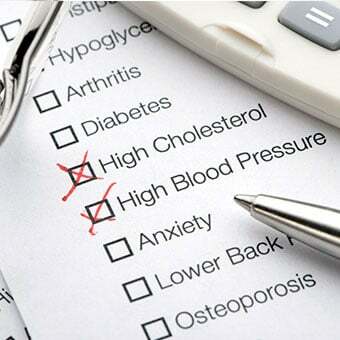 High blood pressure and diabetes are independent risks for congestive heart failure. Alcohol and drug abuse may be a cause of heart failure. Diastolic dysfunction: This is a form of CHF in which the heart muscle may be stiff, most often from hypertension or normal aging. The ejection fraction is normal and the prognosis is excellent. The problem is that a stiff heart muscle fills with blood at a higher pressure, which is transmitted to the lungs resulting in shortness of breath. It must be emphasized that the long-term outlook for patients with this condition is excellent. Self-monitoring of weight and fluid intake. Roger, Veronique L., et al. on behalf of the American Heart Association Statistics Committee and Stroke Statistics Subcommittee. "Heart disease and stroke statistics -- 2011 update: a report from the American Heart Association." Circulation 123.4 (2011): e18-e209. Ho, K. K., et al. "The epidemiology of heart failure: the Framingham Study." Journal of the American College of Cardiology 22.4 Suppl A (1993): 6A-13A.